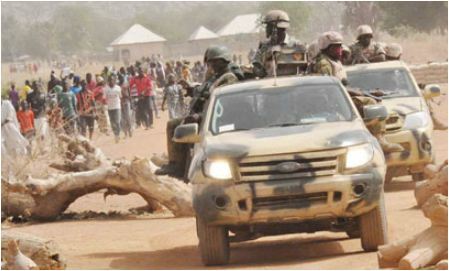 The Nigerian Army said in Tuesday morning that its troops of 143 Battalion deployed at a check point in Gulak Adamawa State successfully foiled a suicide bomb attack at Gulak Adamawa State. The army on its Facebook page said troops neutralised a girl with Person-Borne Improvised Explosive Device who tried to Infiltrate DAR Village to detonate her explosive vest in the early hours of 26 November 2018. In another development, the army said troops of 707 Special Forces Brigade Makurdi, operating along Katsina Ala -Zaki Biam general areas, engaged some militias on 26 November 2018. One militia member was neutralised with others fled with gunshot wounds. Items recovered include locally made weapons and ammunition.